“This is a tremendous achievement for Mid-State,” said Kolina Stieber, director of Marketing & Communications for Mid-State Technical College. “The College strives to creatively tell the Mid-State story through our media outlets—winning a national award signifies that we are hitting the mark in bringing information regarding our flexible, affordable, quality in-demand programs to the communities we serve. With more than 1,700 members from nearly 650 colleges across the United States and Canada, the National Council for Marketing & Public Relations is one of the fastest-growing affiliates of the American Association of Community Colleges. It is the only organization of its kind that exclusively represents marketing and public relations professionals at community and technical colleges, and its prestigious Paragon Awards recognize outstanding achievement in design and communication at community and technical colleges. This year's competition drew 1,939 entries from 262 colleges across the United States and Canada. To learn more about Mid-State’s programs and services, please call (888) 575-6782 or visit the College’s website at mstc.edu. Mid-State Director of Marketing & Communications Kolina Stieber with the College’s national silver Paragon Award from the National Council for Marketing and Public Relations (NCMPR) at the organization’s annual conference in San Antonio, Texas. Mid-State earned the award for its 2018 television/video ad-series. 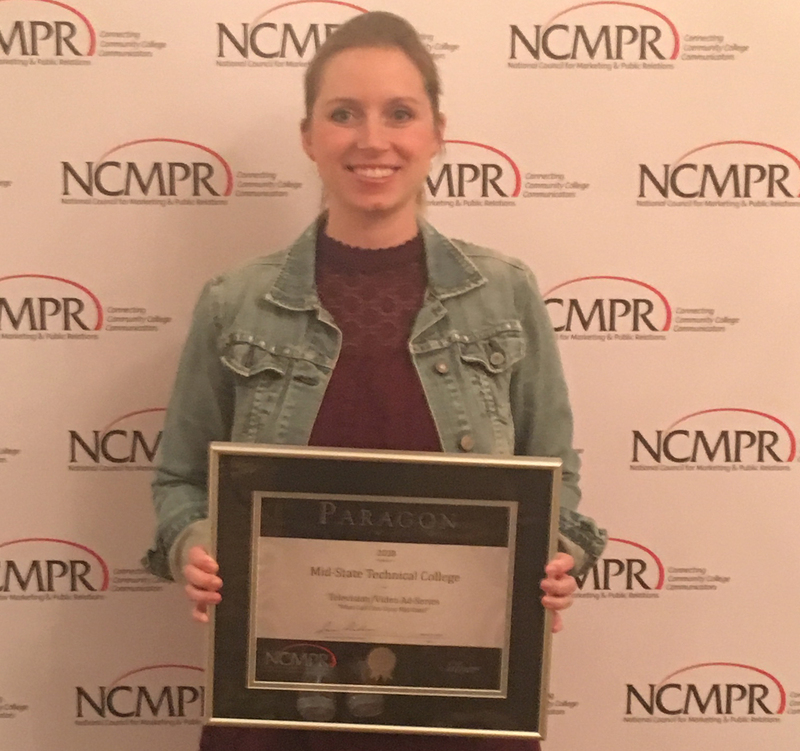 Mid-State Technical College’s Paragon Award from the National Council for Marketing and Public Relations (NCMPR).